Here's the first picture of Richard Woolsey wearing his new uniform on Stargate Atlantis. The nature of the medical emergency is our flutters of excitement at seeing Robert Picardo in his snappy new threads. But Woolsey has some serious shoes to fill - bald authority figures (both good and evil) have reigned over science fiction forever. 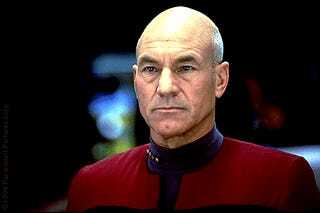 And Jean-Luc Picard isn't even the coolest bald leader in science fiction. Click through for a gallery of our favorite baldies. Woolsey was promoted to Commander after they axed Samantha Carter at Stargate Atlantis. Check out his new digs in the gallery. Some help from Sentient Development.